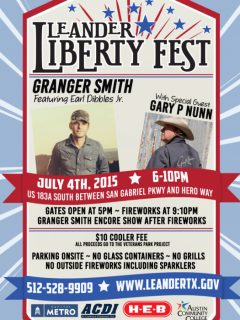 Celebrate Independence Day in Leander with children's activities, great food, cool vendors, live music from Granger Smith and Gary P. Nunn and (of course) an awesome fireworks display at nightfall. You are more than welcome to bring your own food and drinks, however there is a $10 charge per cooler (which will go the development of the Leander Veterans Park). The festival will take place on US-183A between Hero Way and San Gabriel Parkway.